With us needing a new electric cooker, we had set aside a maximum of £450. With this budget we wanted a 60cm double fan assisted cooker, black finish, ceramic hob, interior light and energy rating A (preferably on both ovens). After browsing online at Curry’s and Comet, we decided to head down there and check out our faves in the showroom. We were very disappointed at the lack of black freestanding cookers actually out on the showroom floor. Kelly was not impressed by the slightest. We were in Curry’s, where we had bought our washer that time, and the staff were very unwilling to help – they just stood there like they had better things to do! I was quite shocked really, I had been at work all day and had £450 in cash burning a hole in my pocket! (I don’t purchase goods via my bank card anymore, as twice I’ve been double charged for goods well over £100 so cash is my means nowadays – and I have OCD anyways so it’s not like I’ll lose the cash if I’m a ‘constant checker!’). Anyways, when a member of staff actually realised we weren’t stood around for the good of our health, she sent someone over to help us. 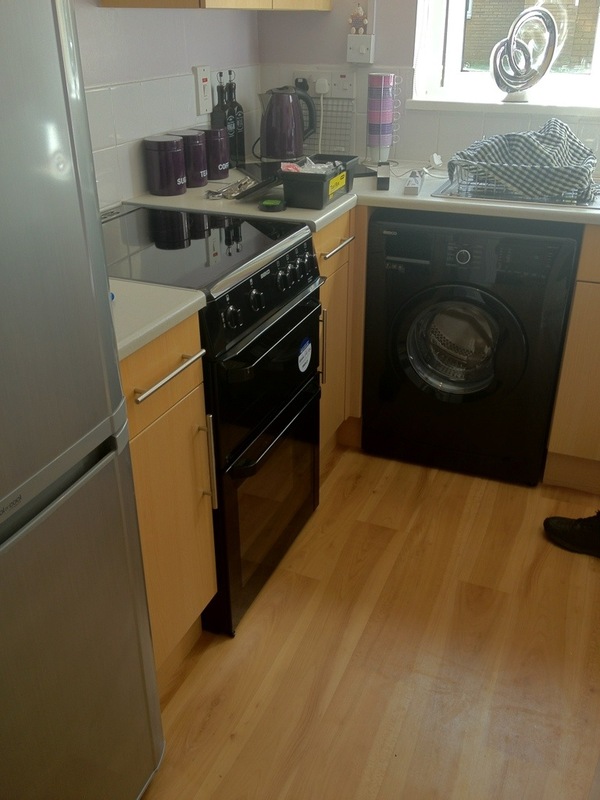 He was adamant that ALL gaps between the units where the cooker fits are 600mm (which is 60cm). Kelly had measured our gap before she came to meet me to go to the store. Kelly wasted no time explaining to the guy that our gap was not quite 60cm (it is across the back, just towards the front the gap is approx 2mm too short – nothing Trev’s tools won’t sort!). We actually have some kind of metal edging screwed on either side of the work top, so we’re hoping once these are taken off we will have a big enough gap, front and back, all the way across. So anyways, with Curry’s staff not bringing any black cookers up online for us and talking down to Kelly (as if her measuring skills were wrong!) we thought we’d just go to Comet. Comet is actually next door to Curry’s where we live, so it wasn’t as if we had to travel far. We wasted no time going straight up to a member of staff and telling them what we wanted. The guy searched his Comet online system and came across a 60cm Beko oven, in black with a ceramic hob and energy efficiency A – it was £399. 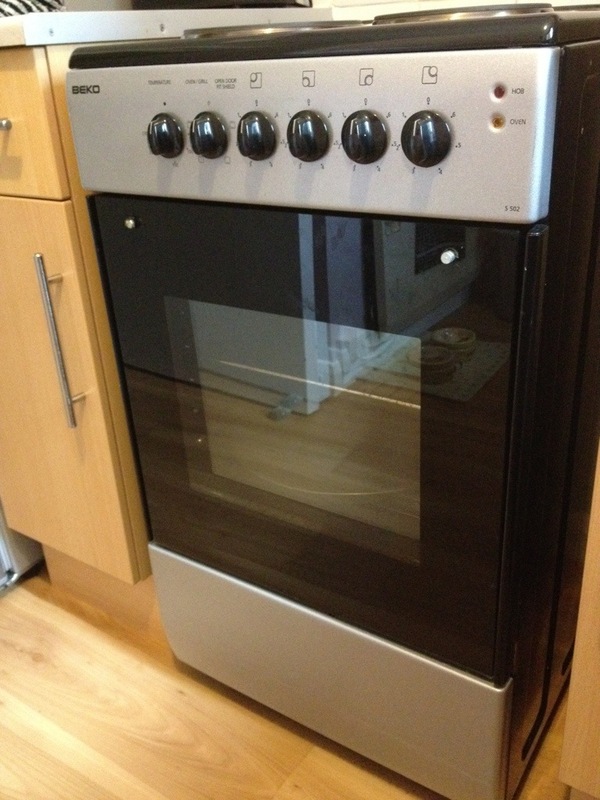 Kelly and I decided to purchase it as it was well within our budget, it was the same brand as our old one – which despite the handle dropping off, and the main oven dying on us, it had been an exceptional oven for three years and it was the cheapest of cheap at the time. 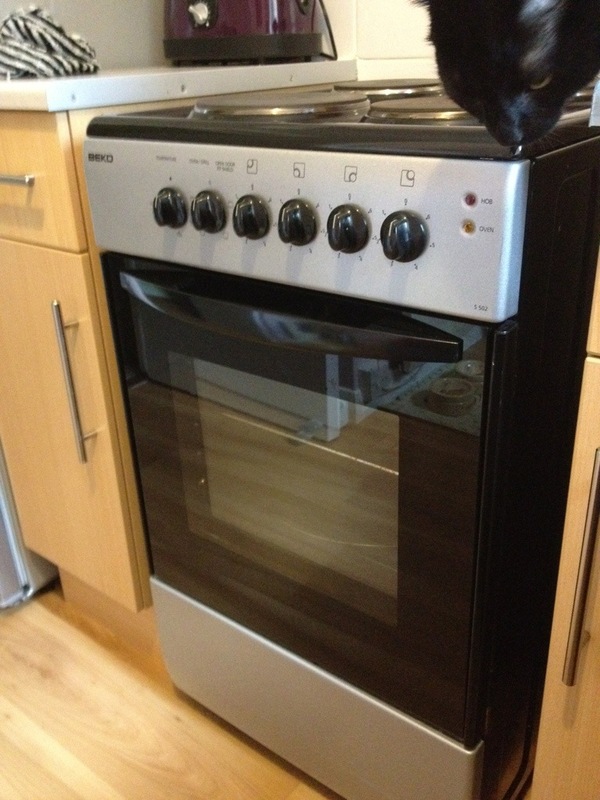 Kelly and I opted for the 3 years cover on the cooker, it was £65 extra – but it covers if the cooker knobs fall off, if the handle drops off, if any parts break – basically it covers wear and tear as well as the obvious manufacturer’s parts. The cost of the cover can be spread over four months, so it actually didn’t bankrupt our budget in the end. The thing I like about Comet, is the fact that they listened to what we wanted. They searched for what we wanted. They found what we wanted, and then gave us express delivery free of charge, and took a £5 discount off our 3 year cover plan. The whole shopping experience with Comet was great! Kelly and I came out the store with enough change to head to KFC for a naughty tea – the perfect way to end a manic/ stressful last thing at night shopping trip for electrical home appliances! Cooker has seen better days! Did I tell you guys about the cooker incident we encountered recently? – I didn’t think so! Well, remember that day the washer caught fire (almost)? All that got sorted however, around four days after the washer incident, Kelly was cooking and she attempted to open the cooker door via the handle – and the handle just fell off! We were both very annoyed about this, as it seemed EVERYTHING electrical that week was breaking (ie: the hair dryer two days prior, which also (almost) caught fire as Kelly was using it – sparks everywhere!). Anyways, with regards to the cooker, we Araldite glued the handle back on – as funds were not available for a brand new cooker at the time. The glue was great, and it held well! Around a week, or two, later Kelly and I were sat chilling in our front room waiting for our BBQ chicken drumsticks to cook. ‘Do you smell that?’ Kelly said, around 30mins after actually putting them in to cook. ‘No, I can’t smell anything darl!’, I replied – confused as to what she was getting at. ‘Exactly, why can I not smell the chicken drummers cooking? !’ Kelly asked. ‘I’ll go and check. (slight pause) ‘OMG, the cooker has flipping broke! !’ I shouted. There was a slight sigh of relief when we realised the hob still worked, but the main oven was well and truly dead! It was three years old anyways, and considering it wasn’t Hotpoint, Indesit or Zanussi it had served us well. 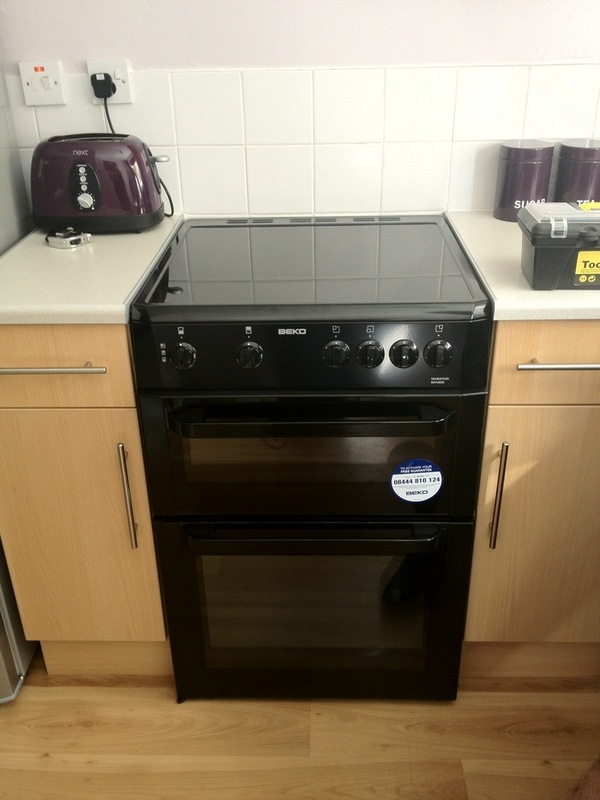 Kelly had bought the Beko 50cm single oven when she first moved in to the flat, it was the cheapest best oven she could find for her budget at the time. It was time to shop for a new oven, a trip to Currys was a must!